If I had to name my biggest character defects, high on the list would probably be my messiness as well as my constant procrastination. This means that my house ends up usually getting very messy, and I have a hard time getting around to cleaning it up- something always comes up and gets in the way of my tidying up. My husband, on the other hand, needs neatness to be able to function. This has been a considerable source of tension in our marriage- that my husband was working full time, then coming home and cleaning up the mess that I made throughout the day. For some time, we had discussed bringing in a cleaning lady, but constantly rejected the idea, since cleaning ladies are very expensive round these parts (they nearly make twice as much per hour as my husband does) and we would only be able to afford to take a cleaning lady maximum once a week for an hour or two. That felt pointless, since our house anyhow was getting totally clean once a week- it was maintenance that was the problem- by the end of every day, my place would be a mess, and it would just get messier and messier unless my husband cleaned it. When I tried to be on top of cleaning it, things always came up. The kids need me, and I can't just ignore them to clean, because then they often end up messing another part of the house while I'm cleaning the first part. And even if my older kids didn't do that, Rose, the baby, often needs to be held. It wasn't like I was being lazy. I was doing stuff a lot of the day. Taking care of the kids. Homeschooling them. Cooking up delicious, healthy, frugal meals. But cleaning always ended up on the back burner. So in order for the place to not look like a bomb hit it, my husband would often stay up late at night cleaning, only to wake up just a few short hours later to head out to work. It was really hard on him, and understandably he would resent it, and would stress out. Then my husband was given the option to increase his hours at work- and since he gets paid hourly, that meant a bigger income. However, I wasn't sure what to do. I knew myself. I knew I could try to get the place cleaner, but I have a hard time with consistency. I start projects and then stop them after a short time. Its hard for me to stick to the task, especially on a long term basis, and I knew that that was exactly what Mike needed. I knew that even if I promised that I'd keep the place cleaner on a regular basis, despite my best intentions, it wouldn't happen. And then I thought- what about a mother's helper? A mother's helper is exactly what it sounds like. Kind of like a cross between a babysitter, a cleaning lady, and an older child. 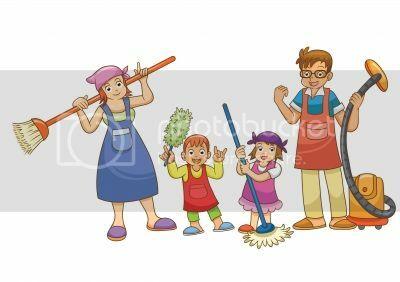 Mother's helpers are generally too young to be babysitting on their own, too young to actually do serious cleaning, but are old enough to pitch in. I decided to try it out, see if I can find a mother's helper from my community, to come by on a regular basis, to help me out with the kids and some light housework. I now have a mother's helper coming by 4 days a week, an hour and a half to two hours a day. So, what does a mother's helper actually do, and why do I find it so life changing? Well, first off, there's the fact that I know that each day, at a set hour, I'll be having someone coming by, and this is my time to get the place clean. No procrastinating. No finding something better to do. This is my structured time to get the job done. Does that mean that my mothers' helpers actually clean? Sometimes yes, but more often than not, it's actually me cleaning. It's just that I have it built into my schedule as a set cleaning time. I consider my mother's helper kind of like I would an older child- a child who has age appropriate chores- but they're more willing to do these chores since they know they're getting paid. That doesn't mean I can ask them to do anything and they'll gladly do it. No- they're kids after all. Not servants. Because of my mother's helpers, I feel my life is so much less stressful. I feel less overwhelmed, more able to accomplish things. I can't say my house is always perfect, but the baseline of my house is much better than it used to be. And my husband doesn't have to do it, so he can work the longer hours without stressing about needing to clean up the messy place when he gets home. The best thing is- I find myself often cleaning earlier in the day, making the place already the standard "clean" my house gets to now, even before my mother's helpers arrive, so that I get to the bigger projects that always get pushed aside, because I can't do them until the house is neat, and every day instead of doing the project, I was just cleaning up... But now, I've found time to declutter, organize cabinets and dressers, etc... and get to the deep cleaning on a more regular basis. On top of everything- my mother's helpers are usually here right before my husband gets home- so he gets to come home to a clean house, something that's very important to him. Oh, and because the place now stays cleaner on a regular basis, cleaning up takes less time and is less of a chore to get done, because I don't get backlogged too much. In short- getting a mother's helper on a regular basis was the best decision I've made in a long time. Its made such a difference in my life, in my husband's life, and in my kids' lives. Worth every cent. Much cheaper than a cleaning lady, and more useful for me too. If you are similar to myself, in that housework is hard for you to keep up with, but money is short- I highly suggest looking in to the concept of a mother's helper, and seeing if it'll work for you and improve your life as much as it has mine. Have you ever heard of a mother's helper? Ever have one? If you've had both a mother's helper and a cleaning lady, which did you find was more useful for you, made a bigger difference in your life? That sounds like a great arrangement for all concerned! I've heard of Mother's Helpers. Both DH and I work. Mike sounds a LOT like MY DH. MY DH CANNOT STAND clutter. I'm used to it because growing up in a small house with a brother and sister, our home was pretty cluttered...not messy or dirty but cluttered because there was only SO much space. DH grew up in a MUCH larger home with just a brother (by the time he was born, his older sister was a Senior in high school and moved out the following year when she got married) plus his mom was a SAHM who did nothing all day but cook & clean so their home was sparkling. THAT is what he is used to so THAT is what he expects from me...except I work full-time too and different shifts(Days Evenings for now) from what he works (he works 3rd shift at GE) so it's not like I can do major cleaning during the day before my shift starts as he's sleeping and a vacuum will wake him up as he's a light sleeper. The thing is, we CAN afford a cleaning lady but DH doesn't want to spring for one. Around here a mother's helper is an adult helper. Either just after a baby is born or on an ongoing basis. I'm guessing they're cheap for the support they provide, but definitely get paid as an adult. It's great that you've found a way to get some help and some rest all in your budget. I'm lucky that my husband isn't a neat person either. Our baseline is pretty lax, but we can pull it together... after several hours of child-free cleaning time. If he needed to come home to a clean home, I'd probably be looking for some help! What a great idea! My daughter did this for a while, it's a terrific first job. Glad it's working out so well for you. Lots of people around here use cleaning ladies, often because it forces them to pick up before the cleaner shows up...I was thinking about putting up a card at the grocery store. I can clean, and it would be some extra $$ to offset the high cost of living here. I think it's good to be realistic and accept one's limitations. I'm glad you found a solution.